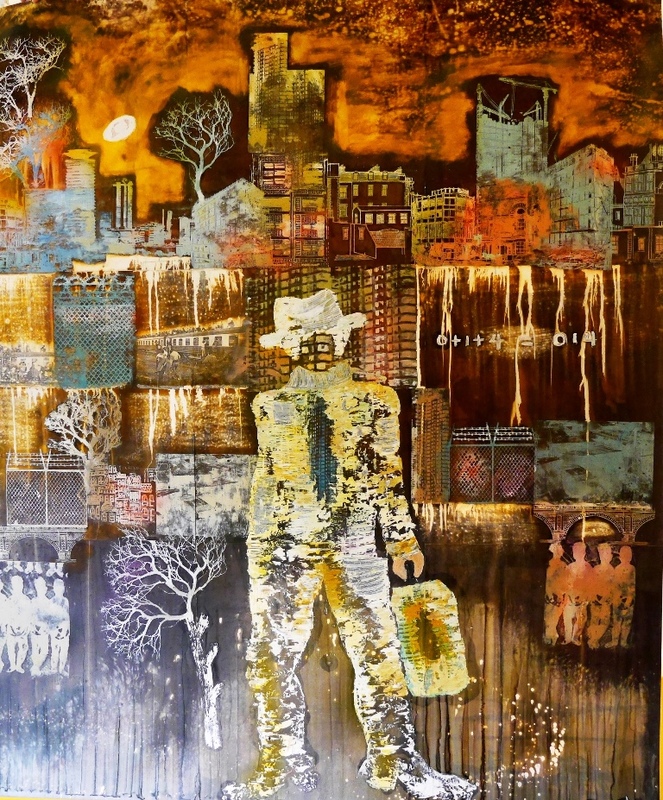 The 4th Modern and Contemporary East African Art Auction, held this year at the Hotel Intercontinental, was much anticipated after the success of the first three art auctions, curated by Circle Art Gallery’s Danda Jaroljmek since 2013. This year’s auction was equally, if not more successful having netted a minimum of KSh19.154 million and still counting since some bidders are calling Danda a day after the auction officially closed in hopes of negotiating with the gallery and the artist to reach a price for a particular work that is amenable to everyone. But even so, monetary value is not the only measure of success. Indeed, what I found most significant about last Monday night’s open market on East African contemporary and modern art was that increasingly, buyers are recognizing the immense investment potential in the purchase of our regional art. Without doubt, Circle’s art auction is providing the broadest and most diverse and breathtaking platform for revealing the astonishing talent, imagination and fine artistry of painters and sculptors, printmakers and photographers in a region that we found included seven countries, namely Kenya, Uganda, Tanzania, Sudan and Ethiopia as well as Seychelles and Zimbabwe. (Then too there was one lone and lovely work from Congo). What this art auction revealed to me was the sort of trust that quite a few local and international art collectors have in Circle Art and its auction. For what the Gallery itself pointed out in a recent press release is that it single-handedly has built up a so-called ‘secondary market’ where art collectors can feel free to bring in artworks acquired in the past to put up for resale. Indeed, dozens of individuals brought in mainly paintings but also a few sculptures in the last year for Circle to auction off; the assumption being the collectors were bound to be blessed with a substantial profit, or at least see a significant difference between what they originally paid for their artwork and what they will receive after their piece was auctioned by the professional British auctioneer, Dendy Easton who came back to Kenya to preside over his fourth art auction late last month (Feb. 27). Not all the collectors who brought in artworks to be auctioned had originally bought their piece for its ‘investment potential’. For instance, Geraldine Robarts had been lecturing in fine art at Makerere University’s Margaret Trowell’s School of Fine Art when she bought a beautiful painting by her fellow lecturer, the Zanzibari-Iranian painter Ali Hussein Darwish in the early 1970s. 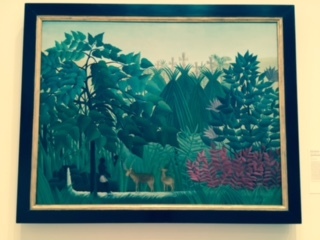 “I bought his painting because he was a dear friend and I loved his art,” said Geraldine who never planned to resell Darwish’s work entitled ‘Forest’. But as she witnessed last Monday, the painting sold for many times more (KSh587,000) than what she originally paid for it. But like so many art collectors who buy art not as an investment but simply out of love for the work, the discovery of how much his work sold for also made her realize that if she had held on to it longer, it most likely would be worth a whole lot more than that. Nonetheless, a number of art collectors who re-sold their art at the auction this year earned relatively fair sums and had no regrets about selling art that they’d invested in years before. For instance, Peterson Kamwathi’s ‘Bull’, painted in or around 2005 sold for Ksh763,100 while the resale of Gakunju Kaigwa’s Vermont marble bust for Ksh704,400 assumedly satisfied the person who gave up this gorgeous stone bust which Kaigwa created after warming up to marble while studying in Carrara, Italy where the marble is plentiful. And even Marc van Rampelberg’s resale of his two rare Edward Saidi Tingatinga paintings was proof that East African art can increasingly be seen as an outstanding long-term investment. 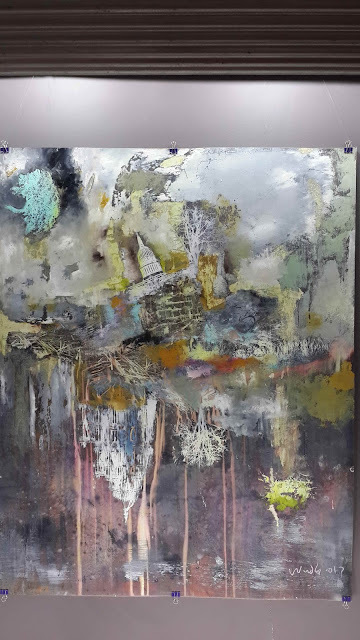 For while one of the two paintings by the acclaimed Tanzanian artist that he brought to Circle for resale earned more than a million shillings, the other earned slightly less at KSh774,840, which still secured the Belgian art collector a fairly good profit. But as attractive as such figures may seem, according to the former Sotheby’s auctioneer Dendy Easton, the prices for the artworks he has seen in the last four years have been extremely ‘affordable’ as compared to prices of art in South Africa from where he had just flown or even in Nigeria or London where he conducted auctions at Sotheby’s prestigious auction house for more than 30 years, after which he consulted for Bonham’s Auction House and elsewhere. “The quality of the art that Danda selects is as good, if not better than the art I have seen in South and West Africa,’ said Easton. He agrees that the Circle Art Auction is amplifying the value of East African art internationally, but he’s still slightly amazed that such excellent artwork can sell at what he described as ‘affordable’ prices by comparison to international sales. Easton’s observation might surprise some Kenyans, especially when they learn that several artworks sold at the auction for more than a million shillings each. For instance, Rashid Diab’s fire engine red painting entitled ‘Too Tasteful’ garnered ksh1,408,800 just as the auction was coming to a close. The other million-shilling-man was Yassir Ali Mohammed, the Kenya-based Sudanese artist whose monumental grid painting, carefully covered in iconic hieroglyphic images and entitled ‘Windows of my Soul’ also sold for more than KSh1.1 million. And the third record-holder was the Tingatinga piece resold by van Rampelberg which also brought in more than KSh1 million. The works of Kenyan artists may not have sold for quite as much, but many came close, as evidenced by the works of Kamwathi and Gakunju. For instance, the large (200 x 300 cms.) untitled cityscape painting by the late Omosh Kindeh ala Eric Omondi sold for KSh962,580, all of which will go to the family of the much loved artist who’d been based for many years at the Kuona Trust. Yet at the same time as some of the resales went relatively well, there were at least ten out of the 54 artworks that went on the auction block Monday night, that were brought back by the Gallery without a sale, the reason being the bidding didn’t reach the ‘reserve’ or minimum bid required. What the bidders may not have realized was the intrinsic value of these rare works of art. For instance, Robin’s batik print of Maasai women on silk is a precious piece of East African art and if bidders had been more aware of the history of Kenyan art, there should have had a bidding war to own the piece. Equally, if the bidders had been aware of the privileged place that artists like Diang’a, Jimnah, Jak, Morris Foit and Edward Njenga hold in Kenyan contemporary culture, they might have appreciated these early works of the artists. For instance, Diang’a’s massive relief sculpture is cemented into the entrance of Kenya’s national Parliament, making it one of the first public art pieces by a Kenyan artist. Jimnah’s paintings literally fill the walls of practically all the Java Coffee Houses in Kenya, and Njenga (who’s still sculpting at age 94) is one of the country’s earliest social realist sculptors. In other words, the public may not yet understand that the early works by all of these artists could be seen as long-term investments, pieces that can do nothing but accrue in value over time. In any case, the other winners of the art auction besides the collectors who entered their art in Circle’s secondary art market, were the artists who shared their work directly with Circle, or in some cases through their gallery. Of course, the Circle gets a commission on all the works sold at the auction but a little less than half the art that Dendy Easton auctioned off the other night came originally from local artists like Dennis Muraguri, Ephraim Solomon, Onyis Martin and Tahir Karmali among others. Nonetheless, the Kenyan artist, Sane Wadu, whose charming watercolor-on-paper painting entitled ‘The Big Race’, sold on the secondary market at the auction for KSh111,580. Sane recalled that particular painting had probably sold in the 1980s for around ksh20,000. His observation implicitly confirmed what we’re saying about the long-term investment value of East African art. But Sane further noted that of the artist won’t be receiving a penny from the resale of their art. “In some countries, it’s the case that when art is resold, there’s a small percentage that goes back to the original artist, but not in Kenya,” he said. “Back then the artist was a poor man, and unfortunately, still today, the same artist is poor,” he added. Still Sane’s not begrudging of the art auction or the collector who earns a profit off his work, but he does wish the Laws in Kenya could be changed to enable artists to obtain royalties for the resales of their art. The 4th Lamu Painters Festival broke records this year, and not just because no less than 40 artists from Kenya and overseas took part in festivities from February 2nd through the 20th. In past years, the numbers rarely exceeded 25 painters. But there were several additional features to this year’s showcase of multimedia art, apart from painting. There was everything from sculpture (some assembled on the sandy shoreline) and live music (performed on indigenous instruments and staged on dhows as well as on solid ground) to audio-art and a wide assortment of other experimental works of contemporary art. But the main change this year was the inclusion of the 1st Lamu Arts Festival which coincided with the final days of the Painters fete and featured greater involvement of Lamu County government, which among other things, facilitated the grand opening of the February 17th weekend at both the Lamu Fort and the large public courtyard in front of the fort. That was where the live music montage which attract huge numbers of locals as well as countless tourists and festival artists. Among those who performed were Abaki Simba, with the headliners being the lovely Labdi Ommes and Idd Aziz accompanied by the masterful Michel Ongaro on acoustic guitar. Diamond Beach also organized the Saturday ‘Sunset Sail’ for the visual artists who glided around the bay between Lamu and Manda Islands on five traditional dhows; the journey presented a picturesque finale for the painters. The dhows landed finally on Manda where the hotel provided pizza and a dance party that lasted till the wee hours of the festival’s final day. But it was still Herbert Menzer, the German philanthropist and original master mind of both [Painters and Arts] Festivals who introduced the biggest changes to the Arts program. First off, he expanded the number of Kenyan artists attending the three week art residency, also known as the Painters Festival. Among those who came were several who’d attended past festivals. They included Nadia Wamunyu, Zihan Kassam and Fitsum Berhe Woldebianos. But in addition, Peter Ngugi, Boniface Maina, Waweru Gichuhi, Nduta Kariuki, James Njoroge and Dale Webster also came and painted to their heart’s content. Several local Lamu-based artists also took part and exhibited their works in the Lamu Fort, including Adam Musa and Anna Nordenskiold, the Swedish artist who’s been living in Lamu off and on since the 1980s. And among the other Lamu-based exhibitors were more than a dozen young painters from Anidan orphanage who’d been beneficiaries of an art education program funded by the African Arts Trust. The program has enables a number of established Kenyan artists (from Patrick Mukabi and Onyis Martin to David Thuku and Dickson Kaloki) to come spend a month at Anidan teaching kids how to paint and draw. The orphanage itself was established by a Spanish philanthropist whose aim was to give disadvantaged Lamu children (not only orphans) a place to live, study and have opportunities to emerge from the poverty that plagues parts of the island. The children’s art was downstairs while most of the Kenyan and European figurative artists’ works were showcased upstairs, filling the walls with fresh, sun-kissed views of the island—everything from dhows, donkeys and fishermen to colorful sunrises, sunsets, seafronts, and particularly people, be they children, ‘wazees’ or workers like the coral and limestone carriers being carved from Mahogany wood into larger-than-life sculptures by the German sculptor Joachim Sauter who continues carving with the goal of creating at least two more stone carriers. His hope is to eventually exhibit the seven around Kenya and abroad, with assistance from Herbert who sees Joachim in Shela at least twice a year since the sculptor’s workshop-studio is at Herbert’s latest construction site. The site is where the former Hamburg restauranteur is building a magnificent new boutique hotel which he’s already named the Casbah. And like the previous four Swahili-styled structures that he’s designed and built since 2011, Herbert has included all the modern amenities that any traveler would wish to find in a five-star hotel with the charms of indigenous Swahili architecture and culture in the Casbah. Sauter’s five brawny carriers were on display downstairs at the Fort in its open-air courtyard together with mainly works by artists who’d introduced a whole new component to the festivities. For this year, Herbert chose to invite several conceptual and experimental artists from abroad to participate in a six-week art residency in Lamu. “I think Herbert invited us to work for six weeks [rather than three] because he knew conceptual art can take more time,” suggested the Portuguese artist Juliana Bastos Oliviera who had come from Hamburg, Germany as did two other conceptual artists, Marc Einsiedel and Felix Jung. The rest were either from Holland (Eveline van der Griend), Germany (Hartmut Beier), Russia (Svetlana Tiourina) or Belarus (Ekaterina Mitichkina). All seven reflect a significant shift in Herbert’s focus, given that previously, his singular support had been for the so-called ‘plein air’ (open air or outdoor) painters, including the kind who frequent the summer ‘painters festivals’ found in Europe and which initially inspired him to introduce a similar festival to what’s become his second home, the fishing village of Shela in Lamu. There’s little doubt that Herbert enjoyed having a younger crop of conceptual artists on hand at the festival. The clearest evidence of this was the way he quickly commissioned the two young experimental artists Marc and Felix to construct a ‘Whale bone Monument’ on the beach near to where a giant whale has gotten beached and died tragically. Herbert had collected all the whale bones in hopes of finding artists who could create the whale monument to commemorate not only that one whale but all the endangered species whose lives have been disrupted, their environments damaged or destroyed by humans. Marc and Felix completed the commission for Herbert but these two adventurous artists had others goals. Collecting their own array of ‘found objects’ around Lamu, their works occupied a whole corner of the courtyard, the most popular of which was a handmade kaleidoscope whose ever-changing color patterns, seen through a tiny peep hole, enthralled both children and adults who, on the opening day of the Arts Festival, had to stand in line to see shifting color combinations they had never encountered before. One of the other experimental works that occupied the fort’s ground floor and amazed everyone who heard the vaguely familiar sounds coming apparently from a large circle-full of rusty tin cans hanging on one wall and called ‘Sound System’ was by Juliana Oliviera. “I spent hours walking all over Lamu collecting random sounds from the streets to capture the sounds of people’s everyday lives,” said the artist. “Then I edited the sound tape down to 17 minutes and assembled all the tin cans I could find into a circle meant to look like a giant speaker,” she added, noting that she ultimately put several miniature speakers behind the tins to give the illusion of sound seeping from the cans. The children were first baffled by her ‘Sound System’ but then charmed by the artist’s ingenuity. But the ‘plein air’ painters were also adventurous in spite of being more figurative than conceptual in their artistic approaches. Among the veterans who’d attended the painters’ festival before were Jurgen (‘the Duke’) Leippert, Diedrik Vermeulen and Piet Groenendjik as well as Karin Voogd, Natalia Dik and Sybille Bross. The new crop of European ‘plein air’ painters who came to Shela this year included the prolific Rob Jacobs (who seemed to capture nearly every picturesque view of the Island), Rob Akkerman, Claire Bianchi, Tatiana Lushnikowa and many others who came from not only Holland and Germany (as in previous years) but also from Russia, Belarus, Israel, the US, UK, Portugal and Sweden. Virtually all the artists came at Herbert’s invitation since his original and ongoing aim has consistently been to spread the word and introduce European artists to the serene beauty of Lamu and especially Shela. He’s still clearly committed to both sharing Shela and promoting tourism in Lamu since he’s sensitive to how the local people have suffered from the Western ‘travel alerts’ that have scared away tourists in the past. Those alerts haven’t stopped his coming several times every year irrespective of the so-called ‘threats’. On the contrary, they have compelled him to invest more into making the festivals a success. One of the most important investments that Herbert made this past year was encouraging the professional British-Kenyan artist Sophie Walbeoffe to paint the island for a book, which she did. Her exquisite watercolors featured in ‘Lamu, an Artist’s Impression’ is the very one launched simultaneously with the opening of the 1st Lamu Arts Festival on Friday evening in a ceremony attended by Lamu County’s Minister of Culture and a broad cross-section of locals, artists and visitors who’d come to the Island especially for the festival. The accompanying text of Sophie’s beautiful book was written by two outstanding Kenya-based writers, Errol Trzebinski and Julia Seth-Smith. Even before the owners of The Hub mall in Karen broke ground a few years back, they are thinking about how to integrate the arts into their overall design. “We’ve been committed to including the arts in The Hub from the outset,” said the Karen mall’s senior manager Jonathan Yach. That’s why Philippa Nyawera of the Hub and Judy Ogana of The GoDown Art Centre put their heads together back in 2014 to plan what ways they could work together to ensure that commitment was kept. It was Judy who then got hold of any number of Kenyan artists and art centres, inviting them to come to the Hub and think about what they could contribute artistically and significantly to the Hub’s piazza (open air central courtyard,). “Quite a few artists came up with interesting proposals, but Peter [Ngugi] had an edge over all of them in that he was the only one to present a ‘marquette’ [or miniature three-dimensional model] as well as a concept,” explained Judy who also worked closely with Carol Lees of One Off Gallery which frequently holds exhibitions of Ngugi’s art. Judy was speaking at the official launch last Thursday (February 23rd) of Ngugi’s ‘Kahawa Tree’, an iconic 32 foot metal statue that he’d been thinking about constructing for quite some time. “I wanted to celebrate the coffee tree since it has played such an important role [especially as a cash crop] in Kenyan society,” said the artist who also spoke at the launch and had just gotten back from the Lamu Painters Festival where he’d attended a three week art residency with several other Kenyan artists. “For instance, revenue from coffee sales has educated so many Kenyans,” Ngugi added, admitting he’d felt humbled and privileged to receive the commission to create public art in such an exceptional environment. “It’s like a dream come true,” he confessed, speaking about his art installation. While conceptualizing his coffee tree, Ngugi said he recalled that in earlier times, Kenyans used to hold community gathering under a tree, which is why he decided to include people to his installation. “There’s a businessman [complete with a briefcase and laptop in either hand], a teacher [also having a tablet] and a family, including a father and son [both of whom have tablets, and the father with earphones],” explained Ngugi who had intentionally given all his characters technical devices “…since that’s where Kenyans are at. They’re very engaged with technology,” he added. Among the crowd that attended the installation’s launch, one person asked where the mama was since Ngugi’s ‘family’ only featured a father and son. “We deliberated on the family issue and decided specifically to have the father come with his son to the tree,” said Judy who added her role in the project was both consultative (together with the Hub and One Off) and collaborative since she shared ideas with the artist as well. One feature of the construction that many commented on is the interactive aspect of The Kahawa Tree. “Initially, people didn’t touch Ngugi’s art, but then we saw children climbing up and playing on it. We’ve also seen people come sit and relax on the [Mahogany] bench, and the tree has even become a meeting point for shoppers getting together at The Hub,” added Judy who like Jonathan Yach was delighted the Kahawa Tree had become such an integral and identifiable feature of The Hub. Ngugi himself has no problem with people interacting physically with his Kahawa Tree. “The internal structure [or skeleton] of the tree truck is made out of galvanized steel so it won’t rust; and the tree as a whole is quite durable,” he said. The bark and bows of the tree as well as the people’s clothes and physical features are all made from soft steel. The leaves are made by his assembling literally thousands of stainless steel spoons. “And the red, ripe coffee berries are also made out of soft steel, symbolic of the abundant harvests and good times that we expect in days ahead,” Ngugi added. Meanwhile, following from the Lamu Arts Festival, some of the artworks by the Kenyan artists who took part in the festival, namely Peter Ngugi, Nduta Kariuki, Boniface Maina, Nadia Wamunyu, Waweru Gichuhi, Zihan Kassam, James Njoroge and Fitsum Berhe Woldebianos, will be exhibited at Kuona Trust in late March. Some will subsequently be showcased in Cape Town at the Nini Gallery from early May. Alliance Francaise also continues supporting Kenyan artists with its Kenyan Pop 'n Roll exhibition that opened Tuesday night, February 27th. Finally, the 4th Modern and Contemporary East African Art Auction was held last Monday night at the Hotel Intercontinental. For details, see the lead story in BD Life. The 4th Lamu Painters Festival broke records this year, and not just because no less than 40 artists from Kenya and overseas took part in festivities from February 2nd through the 20th. But there were several additional features to this year’s showcase of multimedia art, apart from painting. The main one was the inclusion of the 1st Lamu Arts Festival which coincided with the final days of the painters fete and featured greater involvement of Lamu County government including their facilitating the grand opening on the February 17th weekend at both the Lamu Fort and the large public courtyard in front of the fort. That was where the Diamond Beach Hotel provided a marvelous live music montage which attract huge numbers of locals as well as the festival artists. Among those who performed were Abaki Simba, with the headliners being the lovely Labdi Ommes and Idd Aziz accompanied by the masterful Michel Ongaro on acoustic guitar. Diamond Beach also organized the Saturday ‘Sunset Sail’ for the visual artists on five traditional dhows that presented a picturesque finale for the painters. The dhows landed finally on Manda Island where the hotel provided pizza and a dance party till the wee hours of the festival’s final day. Among those who came were several who’d attended past festivals like Nadia Wamunyu, Zihan Kassam and Fitsum Berhe Woldebianos. But in addition, Peter Ngugi, Boniface Maina, Waweru Gichuhi, James Njoroge and Dale Webster also came and painted to their heart’s content. Several local Lamu-based artists took part and exhibited their works in the Lamu Fort, including more than a dozen young painters from Anidan orphanage who’d been beneficiaries of an art education program funded by the African Arts Trust which has enables established Kenyan artists to come spend a month at Anidan teaching kids how to paint and draw. The children’s art was downstairs while most of the Kenyan and European figurative artists’ works were showcased upstairs, filling the walls with fresh, sun-kissed views of the island—everything from dhows, donkeys and fishermen to colorful sunrises, sunsets, seafronts, and particularly people, be they children, ‘wazees’ or workers like the coral and limestone carriers being carved into larger-than-life sculptures shaped by the German sculptor Joachim Sauter. Sauter’s five brawny carriers were on display downstairs in the open-air courtyard inside the Fort together with mainly works by artists who’d introduced a whole new component to the festivities. For this year, Herbert chose to invite several conceptual and experimental artists from abroad to participate in a six-week art residency in Lamu. All seven reflect a significant shift in Herbert’s focus, given that previously, his singular support had been for the so-called ‘plein air’ (open air, outdoor) painters, the kind who frequent the summer painters festivals found in Europe and which inspired him to introduce a similar festival to what’s become his second home, the fishing village of Shela in Lamu. At the same time, his initial design was to also introduce European artists to the serene beauty of Lamu. He’s still clearly committed to both sharing Shela and promoting tourism in Lamu since he’s sensitive to how the local people have suffered from the Western ‘travel alerts’ that have scared away tourists in the past. Those alerts haven’t stopped his coming several times every year irrespective of the so-called ‘threats’. On the contrary, they have compelled him to invest more in making the festivals a success. One of the most important investments that Herbert made this past year was encouraging the professional British-Kenyan artist Sophie Walbeoffe to paint the island for a book, which she did. Her delightful works of exquisite watercolors featured in ‘Lamu, an Artist’s Impression’ was the very one launched simultaneously with the opening of the 1st Lamu Arts Festival. The accompanying text of Sophie’s book was written by two outstanding Kenya-based writers, Errol Trzebinski and Julia Seth-Smith. Apart from ‘Nothing but the Truth’ and Heartstrings’ capitalizing on the deliciously comedic chemistry between Victor Nyaata and Nick Kwach and the dismal dumping of the good Doctor’s (Kwach) aunt (Festus Mackrine), last weekend’s theatre scene primarily belonged to women! Both at Phoenix Theatre and at Michael Joseph Centre, women were un-tamable. Both Maggie Karanja in ‘Pull the Other Leg’ and Julisa Rowe in ‘Nightwatch’ seemed like forces of nature, both organic and alarmingly powerful in their performing appeal. Sadly, the women in Heartstrings’ show didn’t quite know how to modulate their tone, expressing only outrage as they both bellowed without a hint of emotional inflection. Julisa Rowe probably offered the best illustration of how to do that. In ‘Nightwatch’, she played a multitude of different characters, each having his or her own individuality, tonality and mannerisms, all of which made one marvel at this one-woman performance which posed only one problem for me – the underlying patriarchal premise of the production. The story itself, especially as told by Dr Rowe, was enchanting, about a baby girl born just as her father must go to war and her mother dies shortly after the birth of her seventh child. The father leaves just before giving the girl a name and her siblings hand her over to a traveling carnival believing it will bring her up better than they could do. So the child struggles for the rest of the play, seeking but not finding her real name. In the process of storytelling, Julisa plays everyone from the baby as she grows to be a little girl, her siblings and even her dad as well as the Carnival Barker/Manager, the Fat Lady and the disheveled Carnival clown. All the while, she’s belting out songs and using her whole body to dramatize each character. It was an impressive feat which she performed effortlessly (apparently) and with a sensitivity that touched the heart, especially when the father returns home, finds the lost little girl, names her Abigail and leaves her to watch for the next man to give her a new name. It’s a sweet story but women don’t all need a man to feel fulfilled or to establish an identity of their own. As for Maggie Karanja, she puts the ‘horror’ into horrible as she plays Boedicia Hamisi, the hostile mother-in-law in ‘Pull the Other Leg’. The target of her nastiness is her son-in-law Albert (Justin Mirichii) and all her protective instincts envelop her daughter Miriam (Fridah Muhindi). Maggie is another actress who can be convincing both as a terror as well as a tender-hearted mum. Ivy Esther who plays the artist insistent on Albert’s stripping for her to draw her winning life drawing, is also edgy as her powers of persuasion almost get Albert shredded by his in-law. Fortunately, there’s a marvelous twist at the show’s end which allows the couple to live happily ever after and the horrible mother-in-law to be humbled, almost. Tim King’oo deftly directed Phoenix’s first show of 2017 and we wish the Theatre well as ‘Pull the Other Leg’ has one more weekend (tonight and tomorrow) to be staged. And as we’d like Phoenix Theatre to survive, we hope theatre goers get to Professional Centre this weekend; also that Phoenix’s Board of Directors ensure the Theatre is properly managed in future. The one theatre company having the most enviable problem is Heartstrings since it’s got too many fans who try to book tickets too late to get into the late shows. The local appeal of Heartstrings Entertainment is not only its consistency of earthy, indigenized comedy. It’s also the company’s professionalism and their ability to effectively improvise, thus ensuring that timely issues are raised during a show. In ‘Nothing but the Truth’, everything from the Doctors’ Strike to unemployment and ill-advised strategies for coping with economic hardship are addressed in the show. Meanwhile, Amar Desai and his Aperture Africa Productions will be staging the Ray Cooney comedy, “It Runs in the Family’ next weekend (February 24-26) at the Oshwal Centre Auditorium. Partnering with Car-62 Magente Charters to donate revenue from the show to the Rhino Ark Charitable Trust, Aperture has been assisting various charities ever since the group was formed in 2003. If anyone doubts Nairobi’s status as a thriving regional centre for the visual arts, one only needed to go round the city this past weekend to see just a few of the artistic initiatives that have been underway. Everywhere from Kuona Trust, One Off Gallery and Alliance Francaise to the British Institute of East Africa, (BIEA), Red Hill Gallery and the Circle Art Gallery were mounting exciting exhibitions. A few of the most intriguing just ended, as in AF’s ‘Connectivity: More is Less?’ show featuring artists from Maasai Mbili and Dust Depo; Michael Soi’s Bevy of Beauties at Kuona, the revenues from which he plans to donate to the Kuona Artists’ Collective, and BIEA’s multifaceted and multi-media ‘Sensing Nairobi’ showcase that took over the entire institute (as well as parts of Kibera, Mathare and Buru Buru) last weekend. Fortunately, ongoing shows continue at Red Hill where a slew of Sudanese artists’ works are on display through mid-March and at One Off Gallery where Paul Onditi’s ‘Background Effects’ bears witness to the more abstract realms that the artist evoked in his previous paintings which charted the travels of his beloved character, Smokey. 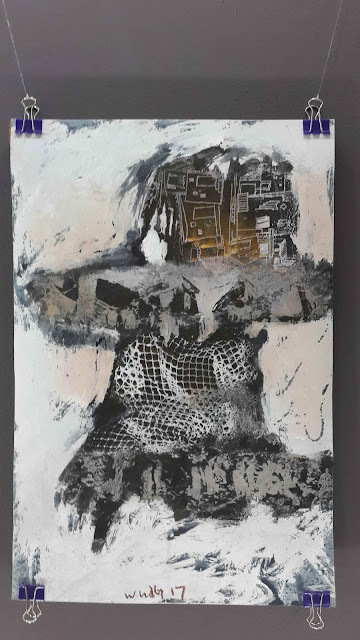 But the exhibition that went up late last week but officially opened this past Wednesday night is probably the most ambitious and illustrious collection of regional art curated by Danda Jaroljmek since she launched Circle’s ‘Modern and Contemporary East African Art Auction’ four years ago. For not only will the Auction feature artworks from ten countries (namely Kenya, Uganda, Tanzania, Ethiopia, Sudan, Egypt, Zimbabwe, Congo, Seychelles and South Africa), nearly all of which are being previewed at Circle’s James Gichuru Road gallery prior to the actual Auction at Nairobi’s Hotel Intercontinental on February 27th. But quite a few of the artworks have a vintage patina since they’ve come out of a number of private collections, meaning the art was often procured several years ago. This is certainly the case with Gakunju Kaigwa’s exquisite Vermont marble bust, Peterson Kamwathi’s ‘Constitutional Bull’, Robin Anderson’s rare batik on silk ‘Maasai Women’ painting and Ali Hasein Darwish’s elegant ‘Forest’. 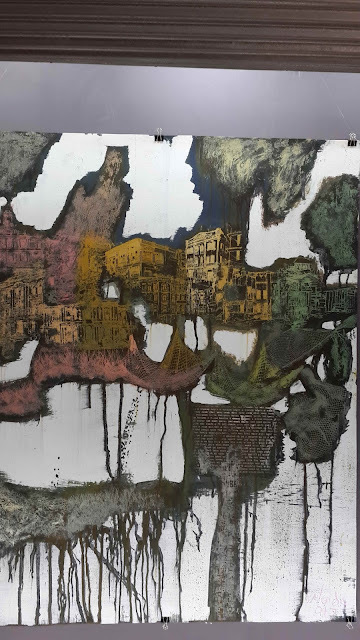 Darwish is originally from Zanzibar but he hasn’t been traceable since he returned to his ancestral home in Iran; and the late Robin Anderson was the co-founder of Gallery Watatu with Yony Waite, two of whose paintings will also be in the auction. But at the same time as Circle has been the beneficiary of various art collectors who’ve chosen to put the early works of everyone from Jak Katarikawe, John Diang’a and Charles Sekano, (the South African artist who lived in Kenya for several decades before returning home in the 1990s) into the auction, Danda has also assembled quite a few contemporary works directly from the artists. Among the artists who have graciously put their art up for auction are Onyis Martin, Boniface Maina, Ato Malinda, Tahir Karmali, Shabu Mwangi, Dennnis Muraguri, El Sadig Agena, Tibebe Terffe, Dawit Abebe and Lilian Nabulime among others. I must commend Circle Art for sharing this rich array of not only East African art but also works from Central and Southern Africa as well. Meanwhile, Circle has also curated another Pop-Up Paper Art exhibition, this one currently underway in Lamu through February 27th. That show features works mainly by artists who are not included in the auction (apart from Boniface Maina, Onyis Martin, Shabu Mwangi and Yony Waite). But at least one of them is also in Lamu attending Herbert Menzer’s 4th annual Painters Festival. The Painters Festival used to include primarily artists from Europe, especially from the Netherlands and Germany. But increasingly, Kenyan painters have been invited to participate as well. This year they include Nadia Wamunyu, Waweru Gichuru, James Njoroge, Zihan Kassam and Boni. The Painters Festival (which apparently got renamed this year ‘the Lamu Art Festival’) is an annual event which Mr Menzer launched out of love for art and love for Lamu, especially Shela. The retired restauranteur from Hamburg is a marvelous host and had researched the island so well that he daily ensures that his artist-guests have new and picturesque locations where they can stake out spaces of their own and paint to their hearts’ content all day. All the artworks created during the two week festival will be on display at the Lamu Fort next weekend, from February 17th through 19th. It’s been nearly five years since Paul Onditi put on a show at the One Off Gallery in Roslyn and many things have transpired in the artist’s life since then: One important event being his decision, seen in his current One Off exhibition entitled ‘Background Effects’ to dispense with his iconic character introduced to Nairobi even before his first One Off show, Smokey. The endearing character of Smokey is etched in our artistic psyche in a way similar to how he and his ambiguous environment were conceived by Onditi using caustic acid and salt on plastic (not canvas, linen or silk). Smokey first appeared in public not long after Onditi’s return from Germany where he’d studied for several years at the Offenbach Academy of Art. We got acquainted with this quirky, adventurous character who always had his back to us but who seemed to be on an incredible journey into realms that looked like a surrealistic cross between fantasy and reality. Smokey appeared everywhere from Alliance Francaise and Village Market to the ISK and Manjano annual art shows, all the way to the Kiboko Bay Resort in Kisumu. I didn’t see the artworks he sent to the US where he exhibited last year in New York but there’s little doubt that he’s been planning to explore new vistas of artistic options for quite some time. Not that we had grown weary of Smokey but the current One Off show is clearly a good site in which to remind us the man has an adventurous and experimental streak that went far beyond just one emblematic character. In fact, one might see the residual effects of Smokey’s esoteric realms of inquiry in Onditi’s ‘Background Effects’ show since the works are largely colorful, abstract and evocative but elusive as far as overt meaning goes. The critic who writes for One Off suggests there are political undertones in the art, but that’s pure speculation. Onditi’s new works seem more serendipitous and exploratory into the worlds of color, elusive concepts and individualistic interpretation. Onditi’s art never fails to inspire, so I encourage you to go and see the artist’s new ventures into artistic expression which I personally warmly welcome. Meanwhile, much is happening in the art world this month. In Lamu, for instance, the annual Painters Festival is underway, organized by the epicurean architect and contractor, the German art lover, Herbert Menzer. A number of Kenyans are camped out in the Shela ‘suburb’ of Lamu including Nadia Wamunyu, Nduta Kariuki, Zihan Kassam, Fitsum Berhe, Sophie Walbeoffe and several others. The rest of the artists are Europeans who love the ‘plein air’ approach to painting in the outdoors. An exhibition all the artworks they have been creating since February 1st when the Festival began will be held February 17th and 18th in Shela. Elsewhere, the Little Art Gallery will be hosting a second Garden Art Exhibition in Roslyn Heights this Saturday from 1pm. William Ndwiga is back doing his mobile art shows which are an excellent innovation, enabling members of the public who might otherwise not reach his Little Gallery in Karen or Little Art Gallery in Kisumu to see some of the best local artists shown out in the open on mobile easels. Finally, this Saturday will also witness the launch of the second annual Chocolate Festival at the Dusit D2 Hotel. Meant to coincide with Valentine’s Day celebrations and the traditional giving of loved ones all kinds of chocolates and roses, the Festival will feature a wide variety of chocolates, most of which will be coming from Central and South America and prepared specially by the Hotel’s new pastry chef. Dusit D2’s General Manager Michael Metaxas has already proved himself to be a Kenyan art lover, having hosted the Last-Saturday-of-the-Month exhibitions of Kenyan art in the Dusit’s spacious Den for more than a year. So it’s no surprise that he’s continuing with the chocolate art initiative that he began a year ago when Adrian Nduma painted lovely portraits using several shades of hot melted chocolate, which were auctioned off during the Festival’s inaugural weekend. In addition to having several marvelous chocolate coated meals during the four day festival, chocolate artworks painted by Patrick Kinuthia will also be exhibited and on sale from tomorrow through Valentine’s Day on Tuesday. One other exhibition that no one interested in Kenyan art should miss is Yony Waite’s ‘Controlled Accidents’ which is ongoing at the Polka Dot Gallery inside The Souk (across from The Hub Mall in Karen. Chicago is not exactly the ideal spot to visit in January which is the ‘dead of winter’ in the Mid-West of the US. The days are cold and overcast; one can go for days without sighting the sun and one can’t go outside without wearing layers of wooly sweaters, socks, scarves, hats and even earmuffs to help you endure Chicago’s bitter wind, nicknamed ‘The Hawk’ since it’s swift and sharp as it’s coming off chilly Lake Michigan. But for me, one saving grace about Chicago is getting to the Art Institute with my friend Robin who’s a card-carrying member of CAI and gets me in for free. Setting off before 9am, we took the express subway that let us off just a block from the place. We could’ve driven since it’s an easy trek down the Outer Drive, the 8-line highway that skirts the Lake and offers an exquisite view of the Chicago Skyline. But parking in the City costs anywhere from USD32 (KSh3,300) for the first hour and then rises after that!! There was nothing special on that day’s program apart from a tour at noon of the Modern wing and the ‘New Contemporary’ galleries of the institute. So we roamed among the medieval and Renaissance paintings that I’d known since childhood when I used to come to the Art Institute regularly with my mum. There were a myriad of artworks and exhibitions that were also new to me since the CAI staff are ever-busy rotating works from their vast store of artworks either gifted or bought over the years. They are also busy booking exhibitions flown in from all over the world, such as those bypassed that day – one on Photography from Japan, another on Religious Art from the Spanish Andes and several more. But as noon drew near, we passed swiftly through the East Asian, Egyptian and Islamic art displays so as to reach the new Modern/Contemporary Art wing in good time. Sadly, the tour guide we got didn’t measure up to what Robin and I had hoped for, since she got stuck for half an hour on one Pop-Art piece, ‘The Jazz Wall’ by Marisol (Maria Sol Escobar) (below). It was an interesting multimedia piece. But since we’d wanted to see as much as we could in the short time we had, I slipped away, checked out works by Andy Warhol, Willem de Kooning and Roy Lichtenstein while everybody else stood patiently as the guide rattled on. I kept checking back in with the group who seemed cemented to one spot; but when we finally got the guts to leave the group completely, we went straight to see our favorite modern artists such as Henri Matisse, Pablo Picasso, Marc Chagall and Vasily Kandinsky. We could have gotten an Audio Guide for USD5 (KSh515), but long ago, I learned how highly informative is simply reading the well-researched wall captions which cost us nothing. Without that encumbering ear-piece, we could freely opine about the art and what we liked and disliked about it. I had to make a special stop before we left at the acclaimed George Seurat painting, ‘A Sunday Afternoon on La Grande Jaffe’ (below). I had to stop not only because Stephen Sondheim had written a whole Broadway musical based on the painting entitled ‘Sunday in the Park with George’, but also because I once met a settler-styled ‘memsaab’ in Nairobi who, upon learning I was originally from Chicago, informed me she occasionally flew into the City just to see ‘the Seurat’! Chicago has lots more to boast about than the Seurat and the Art Institute. There’s Kanye West and Jennifer Hudson, Michelle Obama and even Spike Lee’s hit movie called ‘Chi-raq’, which explores that side of the city best known for what Donald Trump once called its ‘mass carnage’. But Chicago is also renowned for its Symphony Orchestra, its Opera House, fabulous urban architecture and multitude of skyscrapers. It’s also a city full of immigrants and ethnic neighborhoods which mostly coexist apart from those where there are too many drugs, gangs and hand guns. But perhaps what many people will best remember Chicago for is Grant Park, (which is right next to CAI) since that’s where Barak Obama received the word that he’d been elected the first Black American President of the United States. Chicago’s also the city that the Obamas ultimately call home. If Paul Onditi hadn’t followed his wife Christine and new born son James to Frankfurt, Germany in 2003, the Kenya-born entrepreneur and artist would undoubtedly be the biggest fresh fish supplier in Gaborone, Botswana today. Familiarity with the fish business had been a ‘given’ for a young man from Kendu Bay on the banks of Lake Victoria. But building a fish business in Botswana was something else altogether. “It began initially as an adventure,” said Onditi who left a rather tedious job in 2000, working in ‘technical records’ at CMC Aviation to make a tour of Southern Africa and then settle down for a time in Gaborone. “I found tilapia was available in plenty in the Okavango Delta, so I bought a deep freezer and then I’d either dry, fry or sell the tilapia fresh to Zambians, Zimbabweans, and even Kenyans who were all doing business there,” said Onditi who enjoyed going personally to collect the fish. But as much as he loved the fish business, Onditi loved his wife and new-born son even more, and since Christine was a medical student in Frankfurt, he felt his family deserved his first-hand support. Getting a visa wasn’t difficult, but renewing it posed a challenge. He was admitted to the Academy straight away in 2003 and only left in 2010 after the global economic downturn, when life in Europe got more expensive than a fledgling artist with a family could afford. It was upon return to Kenya that Onditi quickly got back into business, this time with his brother and cousin. “We started a vehicle tracking company with my cousin’s financial backing,” he said. Initially spending time marketing Aviarest Trackers Ltd., Onditi admits that marketing comes naturally to him as he gets along with most people. As such, today, the business is thriving and he says at least three-quarters of his company’s clients are Asians. Pointing out that his business is not only about tracking cars, buses and lorries that have the potential for getting ‘lost’, Onditi says the business also keeps track of fuel. “We have equipment that ensures petrol cannot be siphoned out of vehicles,” he adds. But in the meantime, the public face of Paul Onditi is not so much as the managing director of Aviarest Trackers, but as an illustrious artist who’s been based at Kuona Trust since 2011, after he got his vehicle tracking business off the ground. “I wanted to keep my art separate from my business,” says Onditi who feels strongly about not wanting to compromise the quality of his art by painting solely with a price tag in mind. Yet there’s a lot about Onditi the entrepreneur that correlates with Onditi the artist. For both are adventurous, ambitious and innovative. Both are ready and willing to be experimental and try new things. And both have no fear of failure since the man is too busy moving forward to speculate about success. As it turns out, Onditi’s uncompromising attitude in the arts is one factor that has enabled him to quickly become one of Kenya’s most exciting and original contemporary artists who has won accolades everywhere from the Manjano (Nairobi Provincial) Art Festival and to the annual ISK Art Fair. He’s also exhibited at Alliance Francaise, One Off Gallery, Village Market and even the Kiboko Bay Resort in Kisumu. His recent commission from the Norwegian power generating firm, Skagerak Energi, to cover an entire wall of their newly constructed headquarters in Oslo cements Onditi’s status as not just an ‘up and coming’ Kenyan artist but as a professional Kenyan painter whose appeal is global. Working with unconventional media such as caustic acid and salt (not simply acrylic and oil paints), his paintings are rarely to be found on primed canvas. Instead, he prefers painting on plastic sheets that he buys by the rem from almost-obsolete printing firms that he’s found on Nairobi’s back streets. “When their supply dries up, I’ve found other sources in India,” says Onditi whose quirky, surrealistic style centers around one subject – a character he calls Smokey. A solitary character who wanders in what Onditi describes as a realm between fantasy and reality, Smokey’s adventures seem to mirror the artist’s own ambitions to be both a pragmatic businessman and an imaginative artist whose mind transcends convention and is capable of creating art that is both quirky and cutting edge. A few of the most intriguing just ended, as in AF’s ‘Connectivity: More is Less?’ show featuring artists from Maasai Mbili and Dust Depo; Michael Soi’s Bevy of Beauties at Kuona, the revenues from which he plans to donate to the Kuona Artists’ Collective, and BIEA’s multifaceted and multi-media ‘Sensing Nairobi’ showcase that took over the eninstire institute (as well as parts of Kibera, Mathare and Buru Buru) last weekend.